Whether you are a working professional, a house-partner or a school going kid, nothing refreshes you more than a game of table-tennis. From your hand-eye coordination to your temperature or to your spirits, a game of table-tennis raises it all. The problems with buying a table to support our enthusiasm, though, are various. Unlike our hearts, our budgets aren’t very accommodating. Or maybe the space is quite restricted. Or maybe we’re very keen on keeping up with our aesthetic desires. Whatever may the reason be, there is only one way out. 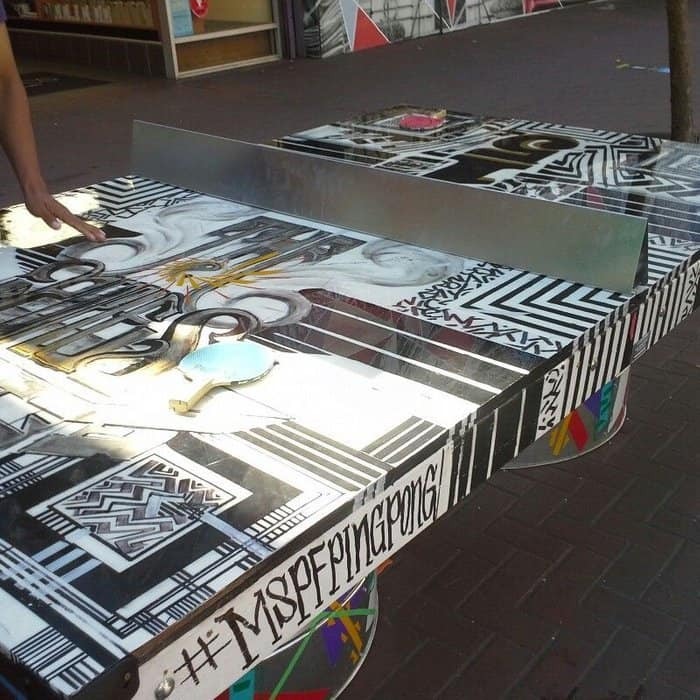 Build your very own custom Ping-Pong table! 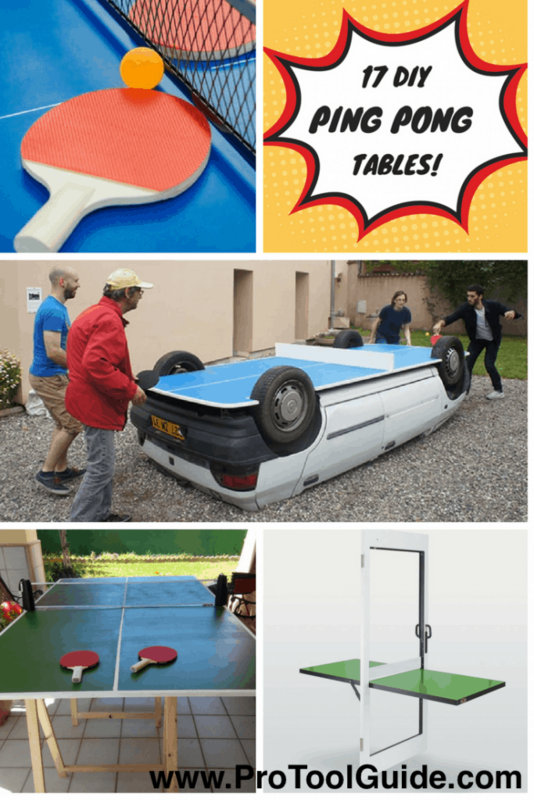 In this article, we present to you 17 Thrilling DIY Ping-Pong Tables to keep your creative builder self busy while the Ping-Pong enthusiast self readies himself for an engaging game. Tired of playing Ping-Pong as an in-basement sport? How about making it an in-TV Room sport? Or maybe even an out in-the backyard or in-the neighbour’s yard sport? If you’re looking for a change in the scenery while playing, then this is the idea for you. This easy-to-make DIY table is a collapsible one that can be folded and moved easily to whichever spot you want to. It is a sturdy and a practical design that will take about half a day to build and other half to dry. Just make sure to be careful while attaching the hinges. This community DIY project reeks of positivity as it serves not only the function of bringing the neighbourhood together but also encourages local artistic ventures. If you want your sport also to be your aesthetic, then here’s a way out to do that in just about 900$. Make your Ping-Pong table an art canvas and get crafting! For further details, click on the link to the blog given below. Why be hesitant to get your kid a Ping-Pong table just because you’re short on space? Try this DIY project instead! This small foldable table is an easy school project design that can be fit into a suitcase and stored very space-economically. This blueprint is open to modifications as per requirement as far as the material, cuts or rivet positions go. So have fun prototyping! This creative design is for those Ping-Pong enthusiasts who have a tough time creating space for their table every time they feel like playing. 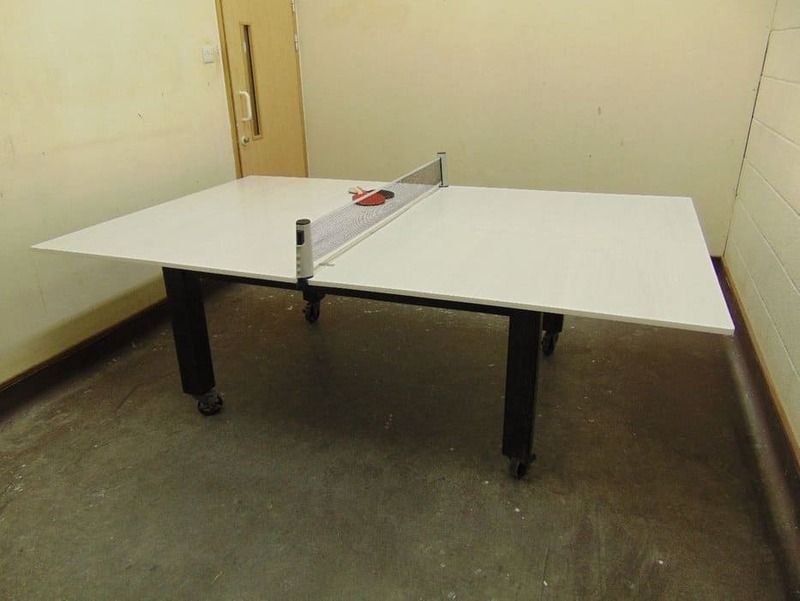 This two-in-one Ping-Pong table seconds as a regular dining or work table as well! This project has a spinning top which would require a lot of patient and careful measurements but the end product is sure to leave you satisfied and Ping-Pong ready. Here is a 100$ project that is ready to use within a few hours for those who are tired of looking for a partner to play with. This table has two detachable halves, either of which can be stacked up against the wall for a solo play. The design is sturdy enough but if you’re still worried about the halves collapsing in the middle of a game, you can reinforce it with some extra mending plates. The crafter suggests using MDF because it won’t warp and will give you a nice bounce. Here’s one more for the space restricted Ping-Pong enthusiasts. This is one of the easiest DIY ideas and takes only a few hours to build but it is recommended to let the glue dry overnight before use. The backside of this table top is a chalkboard that can be added to your furniture as a decorative so that the lying Ping-Pong table doesn’t hurt the aesthetic value of your room. Well, here’s one more of Ana White’s easy to build and pocket friendly (just 40$ worth!) designs. 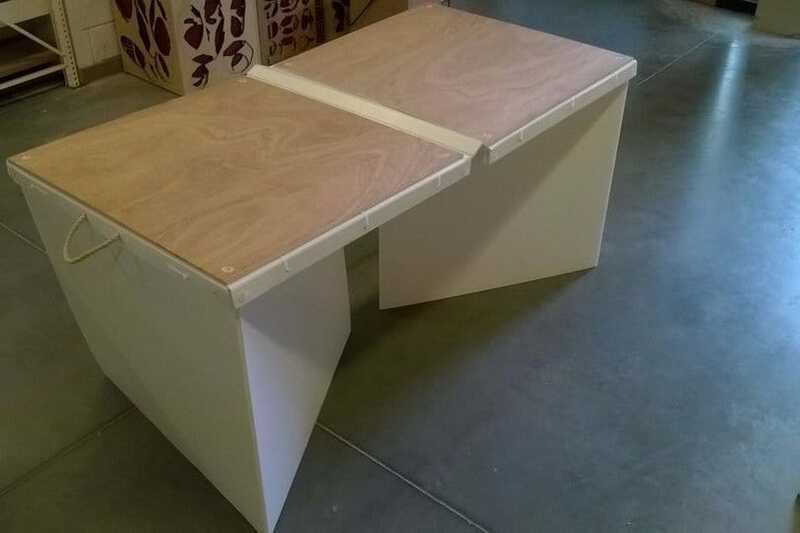 This foldable MDF table is easy to carry and store. It uses a chalkboard top which not only provides a good bounce to your ball but also helps keep your score. Finally something for the absent-minded players! For detailed instructions, click on the following link. 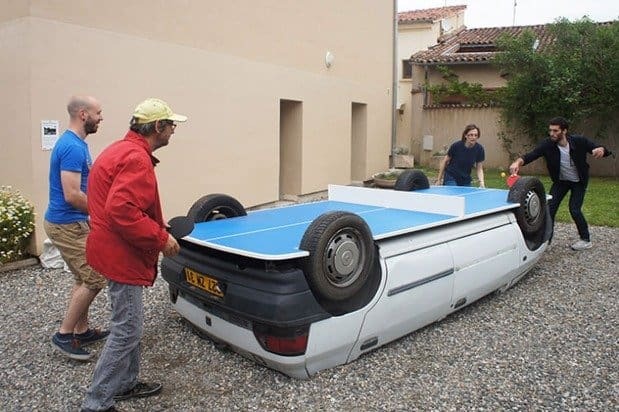 This French artist is known for his upcycled work, and this Ping-Pong table lives up to his reputation. There’s plenty of room to get creative with this one as you use different cars and paint the top in vibrant colours of your choice. Having a tough time letting go of your old baby? Just upturn it and use it as an amusing base for your sport! Further instructions in the link below. All the minimalist Ping-Pong enthusiasts out there, this is your day! This DIY idea by a German interior designer is by far the coolest way to save up your space and add to your aesthetic. 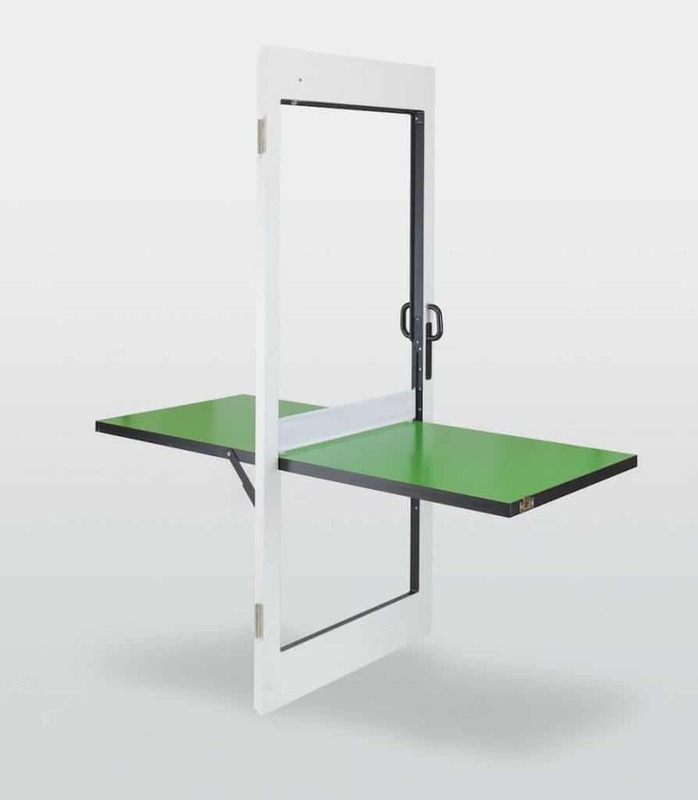 The Ping Pong Door utilizes European sideways open window hinge technology, instead of a fold out. This functional furniture will require prior experience in woodworking and crafting before following the crafter’s YouTube tutorial but it is also available for purchase. Refer to the below site for further details. 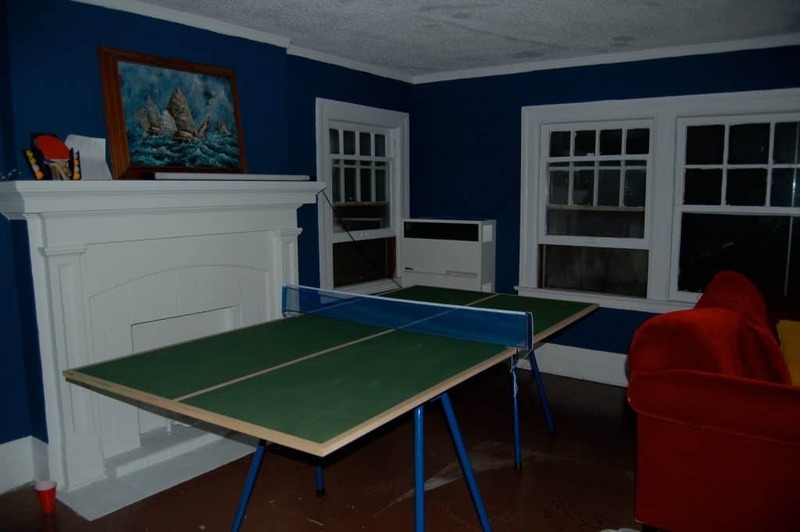 If you’re really low on budget and feel that a Ping-Pong table is a dream far away from reality, then worry not! 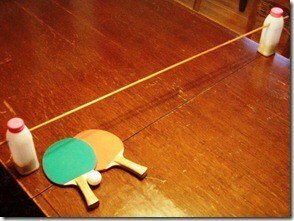 Here’s a sweet DIY Ping-Pong table idea that will blow your minds, and your dishes off the dining table, so to say. This can be made from articles easily available at home, like two plastic containers, a weight for them, wooden dowels, and a screwdriver. Simply empty out the containers and make holes in them and insert the dowel. This can be disposed of easily and reconstructed whenever required. Talk about a quick solution! Planning some indoor fun for the hot summer holidays? 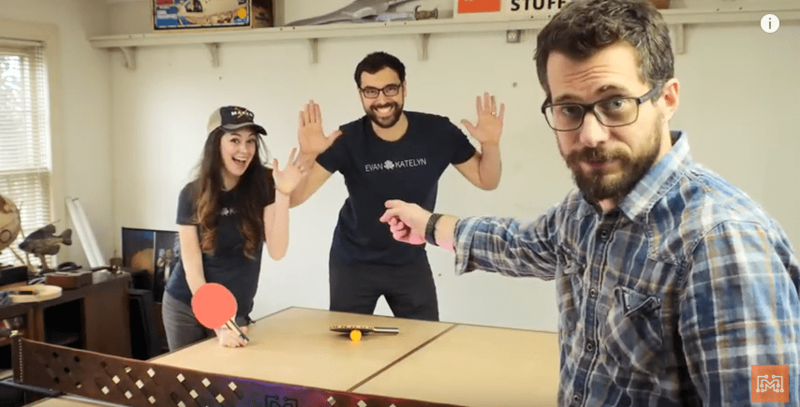 How about making your own DIY Ping-Pong table and fuel your inner Ping-Pong enthusiast and woodworker at the same time? Here’s an idea to keep you busy for the weekend. Just make sure that the paint is dry before using the masking tape and white paint to make the border. With proper instructions from the link given below, you can build a nice table you’d be proud calling your own. Making a Ping-Pong table can prove much healthier than buying a ready-made one. So, if you’re dying to have an inexpensive table of your own, get your wood and glue ready! The dimensions of a standard Ping-Pong table are 60 inches by 108 inches. Because 3/4th inch plywood comes in sheets of 48 inches by 96 inches, you can’t make the table this size using standard sheets of plywood. This table is slightly narrower and slightly longer than the standard one. Making a regulation sized foldable Ping-Pong table will prove to be even more fruitful than a normal one when it comes to cleaning up your house. All the materials needed will be easily available at the local hardware store or at home. Here are the instructions for the same that are easy to follow and cheap to construct. Keep in mind that a bounce of 8 3/4 inches is required by the international authorities in table tennis. To get this, you will have to take a good measure of glue and add it on the two wooden pieces. The advantage of having internet is that you have access to a vast number of ideas and ways to do the same thing. Choose whichever one suits you the most. 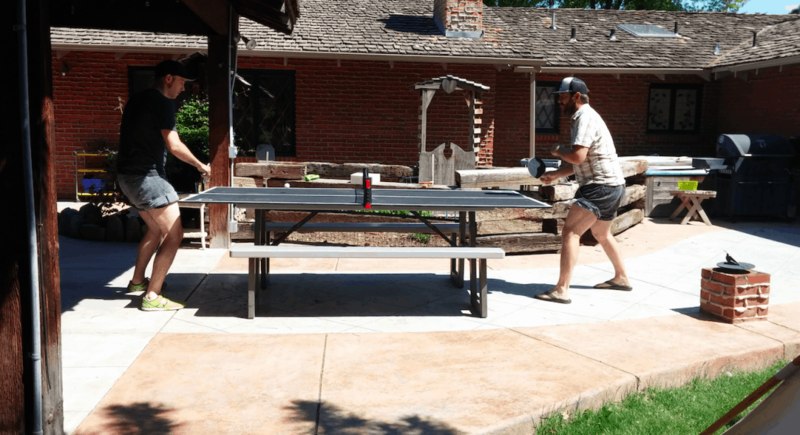 This blog by David Bailey gives a comprehensive idea to build your own Ping-Pong table at a cost as cheap as possible. He emphasizes on the point of making this table your very own by going creative with colour and using any net that you want. Although, the one at Walmart is the cheapest. Also, he reminds that a regulation size table is 5’x10′ or 5’x11′ Masonite, but also costs ten times as much. 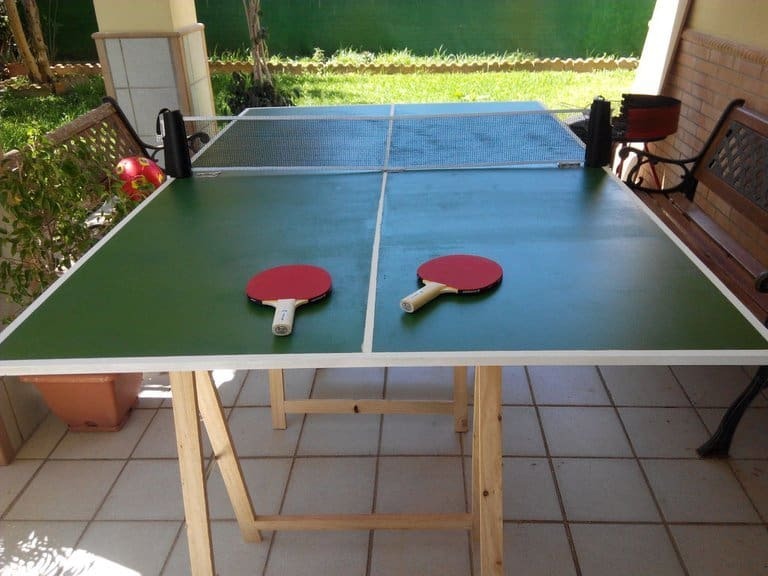 Here is an awesome DIY project for building a custom made Ping-Pong table with a hidden storage and an electronic scoring system. Not one of the easiest DIY ideas but it is totally worth the effort. Who wouldn’t want to flaunt their own Ping-Pong board in front of their friends, after all? This is a week long, well-engineered and a capability laden project so hope you use it to the full extent from using it to play table-tennis to a board game centre or a model making space! Refer to the following link for the entire procedure. 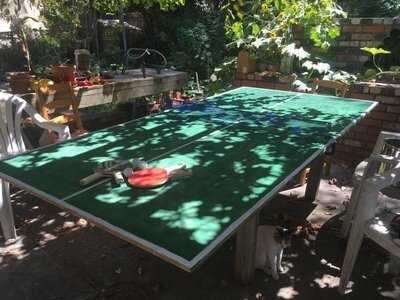 If you’re looking for a good surprise for your table-tennis enthusiast hubby but are low on funds then why not go ahead and make your own Ping-Pong table? The crafter was able to construct a cheap DIY table that is easy to store in the garage and set up wherever you want. A less than day’s effort for months of fun with boyfriend is quite the deal, right? 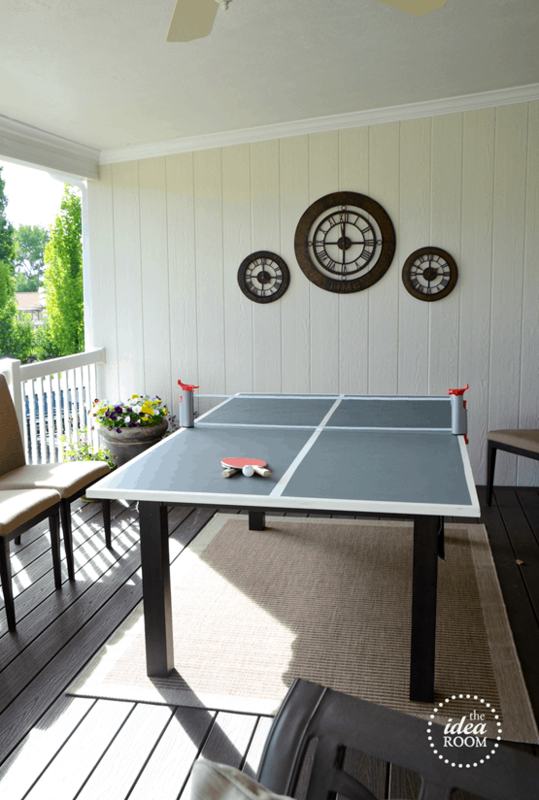 Then get set and go get the plywood, clamps, spray paint and dowels to create a personalized Ping-Pong table at home! Refer the following link for further details. 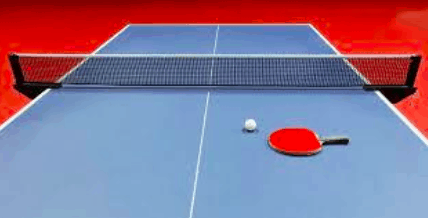 Most of us aren’t regular users of the Ping-Pong table and hence buying or even constructing one seems a like a huge burden. They are clunky to store, end up outside marred by the rains and wind and nice footprints if they’re foldable. 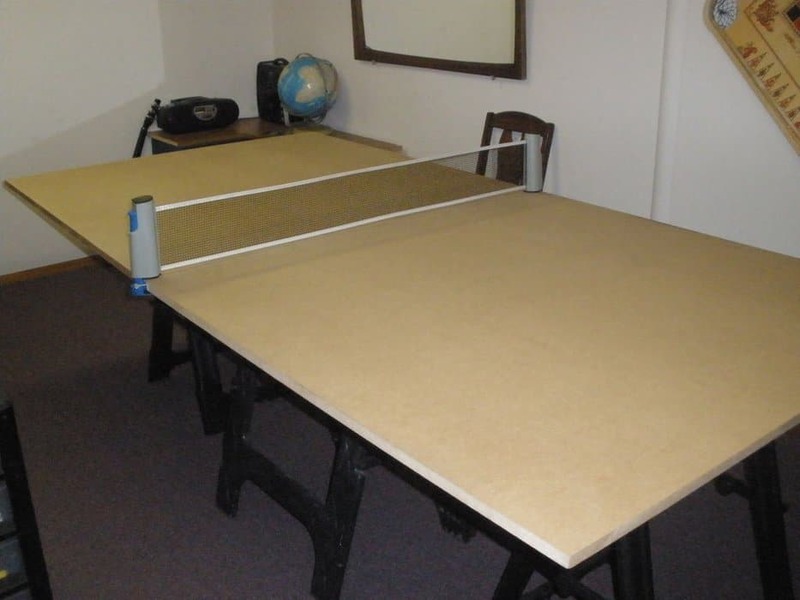 So here’s a nice DIY solution for a temporary Ping-Pong table to avoid all that hassle. It’s not perfect and the ball won’t have the bounce it does on a normal Ping-Pong table but it’s totally worth if you’re just looking for some fun and change from the routine work. The link to the building manual is given below. So, how about a nice weekend with beer pong everyone? The market is full of manufacturers and their grand claims on the kind of Ping-Pong tables you and you’re family will need. But most of us need a custom table fit according to our needs and fancies, and of course, our budget. All the above mentioned links have a detailed, comprehensive instruction manual with visual description but there are certain general things to be kept in mind while building a Ping-Pong table. While some of us can afford to have a dedicated spot for our Ping-Pong tables, not everyone is that lucky. We need to a table that is easy to pack and put away, a foldable one. A table with rollers would also serve well for that purpose. Make sure the wheels have brakes so that the table won’t move while in use. Unless you’re a serious table-tennis player, a 1 inch thickness is not a mandatory feature. A table with thickness 0.75 inch will work just as fine and give a good bounce. Make it a point to use good sturdy material for the legs because they’ll be bearing a lot of weight in the years to come. Although not a necessity, leg levellers would be beneficial if you plan to use the table on uneven grounds. Put your eye at table height and check for warping or bending which might affect your bounce. A 1 meter or 1-yard long spirit level can be very handy for assessing whether the table surface is not flat. The net attachments should have a soft covering so that they don’t scratch the table or dig into the table from underneath. You could use some sticky felt to cover the clamps. 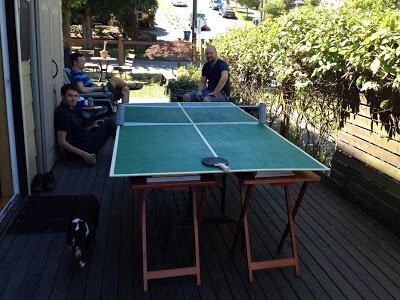 Whatever your requirements related to the Ping-Pong tables, I hope this article helped you meet all those in the most creative, economical and fun ways possible. Since you’re now equipped with an array of DIY ideas, you’ll be able to choose the one that suits you the best. The only thing to be kept in mind while following any procedure would be to take care of both the measurements and of your hands. This exhaustive list of ideas has been compiled with an aim to make you as busy and bouncy as the Ping-Pong ball on a smooth Ping-Pong table.